Thanksgiving may be over but the holiday season is far from finished. Take a break to try a fun, festive dessert. And then, of course, do a thorough taste-test of your work and try not to think about the inevitable food shopping required for your next holiday celebration in a few short weeks. From Sweet! 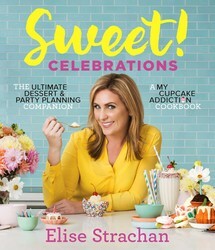 Celebrations: A My Cupcake Addiction Cookbook. 1. Preheat the oven to 350°F. Coat the 24 cavities of a 12-pop nonstick cake pop mold (top and bottom sections) with cooking spray. 2. Make the cake batter. Measure out half the batter and set aside. Divide the remaining batter evenly between 2 bowls. Color one bowl red and the other green. 3. Fill 6 cavities of the bottom section of the cake pop mold with the green batter and fill the remaining 6 cavities with the red batter. Each cake pop cavity should be filled to just over full. 4. Close the mold and bake until the mixture stops pushing out the breathing holes of the cake pop mold, 10 to 14 minutes. Check first at 10 minutes, and then every minute thereafter. Remove the baked balls from the mold and place in the freezer for 20 minutes. 5. Once cooled and semifrozen, use a serrated knife to cut a 1/4-inch-thick slice from the center of each ball, leaving you with 2 hemispheres and the 1/4-inch-thick disk. Reassemble the balls, matching the colors of the hemispheres, but replacing the center slice with the opposite color. 6. Melt the candy melts (see page 220) and place ¼ teaspoon onto either side of each middle disk. Attach a hemisphere to each side to create a completed ornament. 7. Line 12 cups of a muffin tin with paper liners. 8. Place 1 teaspoon of the reserved cake batter into the bottom of each of the cupcake liners. Place an ornament into the center of each liner and press down to secure, making sure the middle disk is horizontal and level. 9. Place the rest of the batter into a piping bag with no tip and pipe the batter first onto the top of the ornament to add weight and then around the outside of the ornament until the liner is threefourths full. 10. Bake until the sides of the cupcake spring back when lightly touched, 13 to 16 minutes. Immediately transfer to a wire rack to cool. 11. Meanwhile, make the mini ornaments: Use a toothpick to make a small hole in the base of each mini peanut butter cup, dip a long sprinkle into a little melted candy, and insert into the hole (this is the ornament handle). Take the gumballs and use a little more melted candy to attach a peanut butter cup to each gumball. 12. 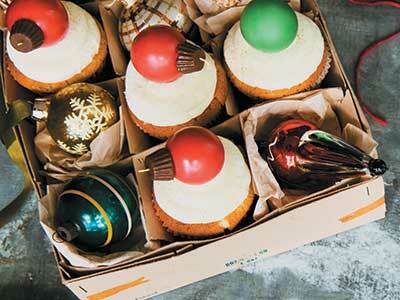 Make the frosting and transfer to a piping bag fitted with a plain tip. Pipe a high frosting swirl and top each cupcake with a mini ornament. Spice things up with a sweet Christmas Candy Martini at this year’s holiday party.